It’s a misconception to believe that short girls can’t wear wide-leg pants. Yes, you can wear these wide-leg pants that are appearing everywhere these days! It just takes some knowledge on how to get this look to be flattering on you and it doesn’t hurt to have a great tailor on hand as well. I am 5’4 with a petite hour-glass figure whose body type can easily be swallowed by the clothes that I wear (meaning my small stature can be overwhelmed by big, over-sized silhouettes). What flatters my figure best are typically structured, straight, and form-fitting clothing (i.e., straight-leg jeans, fit-and-flare skirts, sheath dresses, and tailored tops). 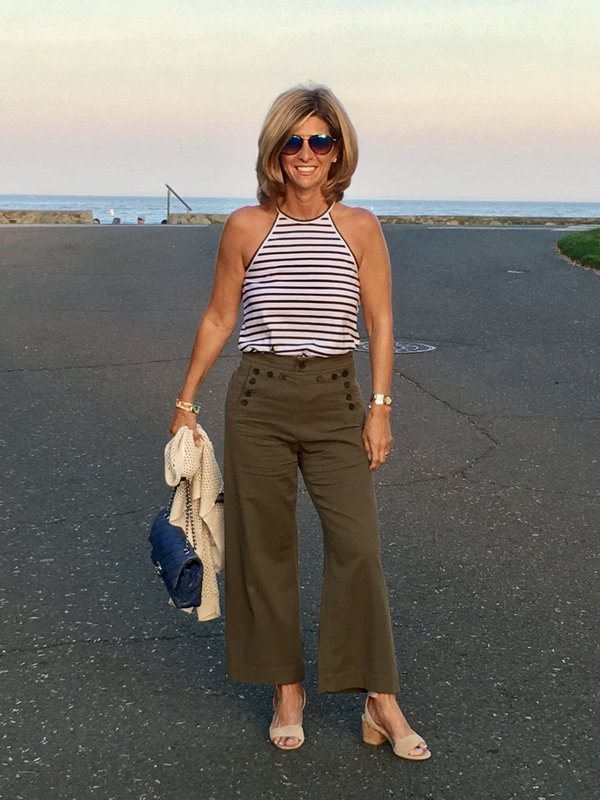 Seeing nearly every retailer and fashion-influencer displaying these elegant wide-leg pants has me excited about giving up my skinny-jeans and trying a new look. However, there are several caveats to pulling off these voluminous pant legs if you are not long and lean. Opt for a high-waist pant style: The higher waist creates the illusion of length which elongates your look. In addition, choose a solid wash so you can retain that unbroken long line. Get a tailor: Where your pant hem falls is of utmost importance in the illusion of height. Once you decide what kind of shoes you’re going to wear with the wide-legged pant, have them hemmed so they’ll just hit above the ground (never touching the ground). It’s all about keeping the line of the pant leg draped straight down, not bunching at your feet. Choose a cropped or ankle length style: For short girls, selecting an ankle length with a 28-inch seam means you will get the full-length effect without going to a tailor. Pay attention to scale: When wearing a pant with volume, always keep the top half of the body lighter than the bottom half to ensure the right balance. It’s best to wear these wide- pant legs with a slimming top like a cropped top or tuck your top in to get the right look. Never pair wide-legged pants with an oversized, boxy top. Wear them with heels: Wearing a heel gives you height and a heel that exposes the top of your foot further elongates your legs. Stay away from styles with side pockets: Side pockets will add extra bulk and create a break in the vertical line that you are trying to achieve. Seriously, there’s no reason why you shouldn’t give wide-leg pants a try (unless you hate them and think they’re ugly). Just make sure to stick to the above guidelines to get the best look!